Despite Speaker of the House of Representatives Paul Ryan’s assertion, in a June 20 speech to the National Association of Manufacturers, that comprehensive tax reform will be enacted in 2017, we are uncertain whether this prediction will come to pass. While we hope Speaker Ryan’s timeline will prove accurate, we fear that he may be overly optimistic, and that we may not, in the near-term, see true comprehensive tax reform. Nevertheless, we feel there is a good chance that Congress, in order to pass some type of tax reform, will enact narrower cuts to income tax rates. Indeed, Congress at present is looking into potentially feasible methods of enacting such cuts. One proposal which has been floated as a potential offset to reductions in income tax rates is the elimination of the 1031 exchange provision, which enables investors to defer income tax liabilities on the capital gains resulting from the sale of a “real property” asset used in trade, business, or investment, provided such gains are reinvested in a “like-kind” real property asset within a specified time period. The Joint Committee on Taxation’s projection is that elimination of 1031 exchanges could raise $40.6 billion in additional tax revenue over 10 years. • An investor owns a real estate property for investment purposes, for which s/he paid $300,000, and which s/he sells for $650,000, producing a capital gain of $350,000. • The same investor wants to invest in another investment property, the purchase price of which is $850,000. • If all requirements and deadlines are met, no tax is payable on the $350,000 in capital gains on the sale of the “relinquished property until the “replacement property” is sold. • If the “replacement property” is subsequently sold, and the capital gain is again invested in a like-kind property, the tax on the capital gain can be deferred once more. 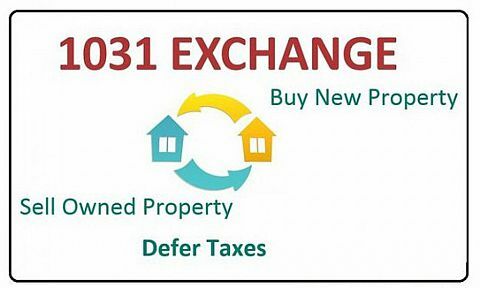 One of the major reasons 1031 exchanges are popular with real estate investors is the ability, absent the necessity of paying capital gains taxes when the sale of a “relinquished property” is executed, to invest the money which would have gone to pay capital gains taxes in the new, “replacement property,” enabling investors to invest more, and garner greater returns on their investments. The House Republicans’ “Better Way” proposal for tax reform might also have eliminated the tax code’s 1031 exchange provision, although the proposal did not specifically address these exchanges. However, offsetting provisions were contained in the “Better Way,” such as potentially allowing investors to treat the entire cost of real estate purchases as a business expense, fully tax-deductible at incurrence, rather than as a depreciable asset, with costs depreciating over a specified time period. Such provisions might have made rescinding the 1031 exchange provision more acceptable to the real estate industry, which accounts for 36% of all 1031 exchanges (the next largest use of 1031 exchanges is for transportation and warehousing, which account for 16% of such exchanges). According to a recent report by Green Street Advisors, 10% to 20% of commercial real estate transactions involve a 1031 exchange. Given that the current Congress wants to enact tax rate cuts and, with comprehensive reform appearing problematic, it is perhaps not overly surprising that the House of Representatives is now considering the elimination of the 1031 exchange without the offsetting provisions originally contemplated. While reductions to the tax rates may benefit real estate industry professionals, industry pushback on eliminating 1031 exchanges is expected. Indeed, there is a cottage industry of 1031 exchange experts and facilitators, who would need to find another niche for their services; we would expect them to object strenuously to elimination of 1031 exchanges. We will monitor the potential elimination of 1031 exchanges – and all tax reform proposals – closely. While we are all for reductions to income tax rates, we believe this particular contemplated offset may have the potential to create significant uncertainties in the commercial real estate market. Stay tuned to our blog for updates and commentary, as events unfold.